What’s the easiest way to grab someone’s attention in an instant? 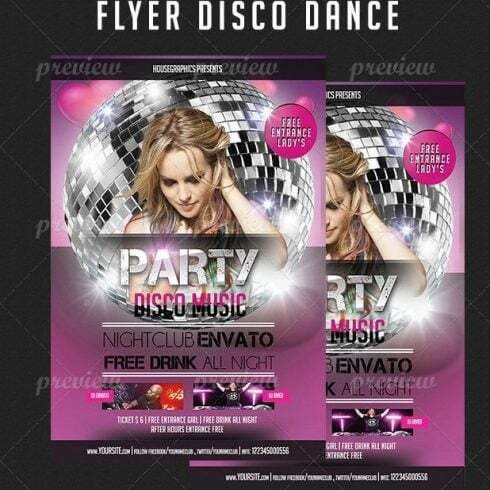 Whether you’re promoting a corporate event or a night club – flyers are the way to go. 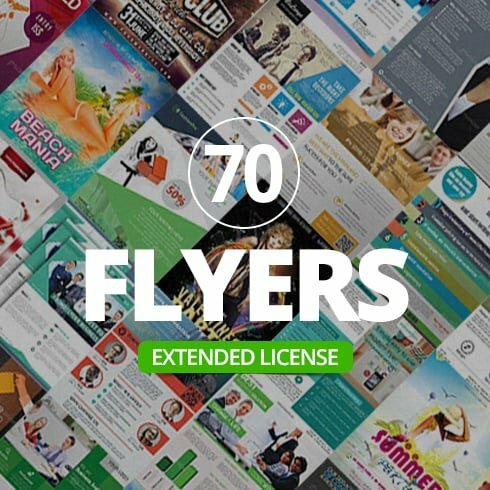 We brought you a huge collection of 70 eye-catching flyers in PSD format. All these resources come with an unique design, making them irresistible for whoever gets one of them. Plus, they are covering so many categories – from holidays, to corporate to parties (and more!) – that you will definitely find something that suits your needs. Usually you would have to pay $2,030 for these premium flyer templates, but exclusively on MasterBundles and for a limited time only you can grab them at only $9! That’s a massive 99% off the regular price! So, what are you waiting for? Get this deal before it’s too late! Every designer, being an experienced professional, undoubtedly can sketch any image from the begining. But for the most objectives, it might take too much effort and will not likely produce sufficient gain for him. This is why most of the designers make use of ready-made visual components – combine these graphic components, modify them and construct the design with them. Noone is going to buy those elements individually, that is why they are combined into graphic packages and offered for sale as a singular product. Would you like a 5% price reduction on any selection from MasterBundles.com? Well, it is not that hard. What you need to do is just share the web page with a package on social network (Facebook). When done, the price cut will be automatically added to your current cart. The benefits of graphic bundle deals for designers are quite obvious. However if you are new to those elements and now have concerns, the subsequent information and facts will probably be helpful for you. Along with a large number of the elements in a single pack, the collection gives you a chance to use several of them for a number of projects. On top of that, the cost is usually cut down tremendously which allows you to stretch your budget, yet have the entire set priced at hundreds or thousands of dollars. Since all of the packages are different from one to another, almost every designer will discover the appropriate collection for a specific project. Exploring them you will uncover the selections including social media infographics, UI kits, business cards, illustration swatches, PPT templates, plus much more. On MasterBundles , you will find over 450 graphic deals available. The bundles of fonts, stock photos, icons, textures, patterns and logo templates are out there at your disposal. They provide almost endless possibilities for the design of different web projects. On top of that, you may find packages of WordPress design templates, training and e-books, cv templates, presentations, and other components. The designers who like to work with photographs are going to be particularly happy about the photo overlays graphic packages. The offers include multiple elements of design used to decorate and modify the photographs. Such kind of ornamental components is normally laid across the images to create some new and unique look. Define a watercolor graphics package deal? The watercolor package deal is found to be the most beautiful novelty in design. Brushed by artists on the a piece of paper, the wonderful pictures become digitized and added in a bundle as design templates for projects. Watercolor elements are just excellent for wedding invitations, blogs and greeting cards. All images are highly detailed and prepared for printing or use in a digital way. What exactly is an Instagram design template? To seduce fans, your Instagram feed should look stunning and fascinating. Instagram design templates will let you reach that goal and make your Instagram content appealing and recognizable. Collected into bundles they could be purchased for a lower price. Posts on blogs that contain infographics are much more readable and well-liked than those that don’t. Infographics are a well known design item each and every designer has to be capable to build. A specialized package for infographics is convenient given it offers a ready-made solution. The designer only has to blend the pictures and voila! If you feel like you’ve lost track of time when researching different resources and elements for your graphic design projects, it is a high time to understand more about MasterBundles. This is a marketplace providing the most in-demand instruments (graphics, logos, presentations, fonts etc.) for designers, marketers, and web developers at a reasonable price for a short period of time. On top of that, you may use coupon codes and promotional codes for specific design deals. In order to not miss significant updates about the forthcoming promotions, we recommend following our blog and signing up for the newsletter. 100 Business Flyers Bundle – Only $29!